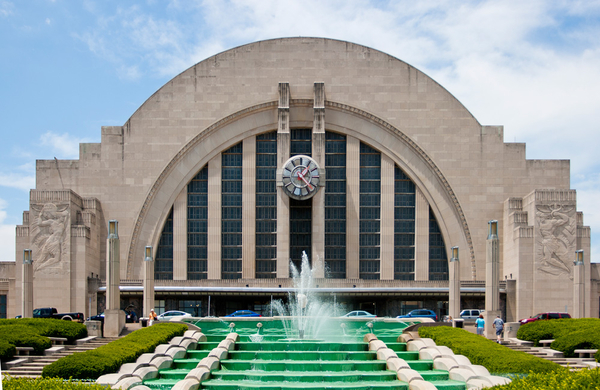 I have always admired the beautiful Cincinnati Union Terminal, CUT. It is the train terminal that I have wanted for the layout I am designing. There are no commercially available CUT O scale models that I could find. My wife gave me a Prussa 3D printer for Christmas and I decided to build my own model and print it. My 3D model was scaled down so only 4 sections needed to be printed to build a small CUT model. The small model is 9" wide, 4 3/4" tall and 6" deep. I am using the small model to evaluate my design. An O scale model without the side wings is about 50" wide and 27" tall. Before I cut the O scale model into sections that can be printed (It will probably take about 10 days to print the parts and $50-100 worth of plastic) I wanted to get suggestions or comments. I hope to use a real clock, the side reliefs still need some work and I will use inserts for the entrance doors and windows. The small printed model is shown in the following pictures. Great idea! Looking forward to seeing your project developing! That will be a great looking passenger station. I have been to the real deal many times, have taken the Amtrak Cardinal to Wash DC. I think this is a great idea and it looks very well executed. One thing - maybe it's my eyes playing tricks on me - but the arc of the center section seems to be a little more shallow than the real thing? The real one seems more pronounced - similar width at the base but stands taller, making for a taller more regal looking appearance. Is it just my eyes? Also, I am actually planning out a new layout and the focal point on one side will be the train terminal. I'm a life long comic book guy and was thinking about making my own train terminal be the Justic League's Hall of Justice, which of course, is based on this exact train terminal. Until now, I was thinking about making it out of foam board. But I'm thinking I need to PM you, as your version is amazing and state of the art! So if my calculations are correct your current rendition would be between Z and N scale?? It looks fabulous. I spent most of my youth in Cincinnati, but traveled through much of my working years handling Amtrak as a customer. So - I have seen many of the grand old stations in the NE Corridor (Lorton VA- Boston), as well as in Chicago, and St. Louis. I have always thought the Cincinnati was among the greatest, dare say even the greatest stations still in existence. Kudos to the city of Cincinnati for NOT tearing down this great old station as part of the (IMO misguided) 1960's - 70's "urban renewal" projects!! I believe the way the photo was taken of the real station along with the foreground landscape could give the illusion that the station is even taller proportionally. If you added a fountain and scenery that would give a more exact look vs the real deal. Also the addition of the clock would also make the station seem more pronounced. On the model of the Grand Central Terminal sold by Lionel, many people added a base to the station giving the illusion of more height and adding to the impressiveness of the station. In my opinion this would really add impressiveness to the station as well. Fantastic job on the station! FOR GOD SO LOVED THE WORLD THAT HE GAVE HIS ONE AND ONLY SON, THAT WHOEVER BELIEVES IN HIM SHALL NOT PERISH, BUT HAVE ETERNAL LIFE. I remember seeing a model of this years ago at Davis Hobby in Milford, Ohio. I really wanted to buy it. I would still love to have model even though I haven't a clue where I would put it. That's some impressive 3d modeling. To-scale O scale structures can be massive, but the thought of seeing some actually built is a bit exciting. A couple I can think of are the San Bernardino Depot (model would be 11 feet long, about 2 feet deep and about 18 inches tall; the UP Santa Ana River Viaduct would be almost 20 feet long, about 8 inches deep and about 20 inches tall. Gotta love monolithic structures if you have the space. That is a great idea! I’m sure you would find several buyers on here if you have success upsizing to scale dimensions.